What You Need to Know: This one had the feel of October with a national telecast on a crisp fall day and both starting pitchers performing at or near the tops of their respective games. The Cubs were trying to reduce their magic number to one while the Cardinals were fighting to keep any semblance of playoff hopes alive. And in the end, this game also had felt like watching nine innings of the Tigers’ right fielder knocking Ryan Braun’s fly ball over the wall. Miles Mikolas is what every player would look like if MLB The Show merged with the Leisure Suit Larry franchise. Whenever he pitches, I can’t help but hope the Cardinals will someday bring back their powder blue road uniforms. But only if they make them out of crushed velvet. He was also brilliant today. After allowing a first-inning run, Mikolas shut the Cubs offense down, combining spot on command to all quadrants of the strike zone with a variety of breaking balls when he needed swings and misses on his way to eight innings of five-hit, six strikeout ball. But then he bent just a bit in the fourth and fifth innings, allowing the first two runners to reach base in both. And maddeningly, St. Louis didn’t require one hit to do so as the fourth inning jam was the result of catcher’s interference and a walk while the fifth came from a hit-by-pitch and free pass. This meant that the only two Cardinals hits of over the first five innings–singles by Paul DeJong and Matt Carpenter–were the margin of victory. On a day where Mikolas was dealing, just those two moments where Hamels slightly slipped up were enough to make the difference. Next Level: We all know Len Kasper is as good as a broadcaster gets. And it’s really great that Fox occasionally gives him a chance to show off what makes him great on a national stage and to demonstrate his tremendous versatility by pairing him with a partner who clearly hates everything about baseball. As you could have expected if you watched a single Fox broadcast from the past two years, John Smoltz spent the entire two and a half hours complaining that this game had the audacity to not be played in 1996. I didn’t think it was possible for anyone to wish that we were still living in the late 90s that much without being a Spice Girl. If he were, of course, Smoltz would be Bitter Spice. And yes, I did just launch a kickstarter to get that added to his Hall of Fame plaque. In the midst of many, many litanies over the course of nine innings, Smoltz bemoaned the fact that too many pitchers in today’s game go for strikeouts all the time and don’t pitch to contact. And it was especially impressive that Kasper managed to somehow restrain the impulse to point out that no one is better qualified to make this particular complaint than a pitcher who accumulated 3,084 career Ks. If John Smoltz’s goal was to pitch to contact, he was without question the worst pitcher of all time. But Smoltz kept bringing this up to praise Mikolas’s approach, using his effort today as an example to which every pitcher should aspire. Mikolas’s pitch-to-contact approach, he suggested, would be much more effective for a starter and should be emulated by every starter in 2018. And don’t get me wrong–Mikolas was brilliant today. Except part of that wasn’t because he wasn’t pitching to contact–he was pitching to the elements. With the wind blowing in at seven miles per hour, Mikolas knew he could get away with throwing as many strikes as he possibly could. And he took full advantage–finding the zone on a positively Madduxish 73 out of 99 pitches on the day. Most of the time it was soft contact. 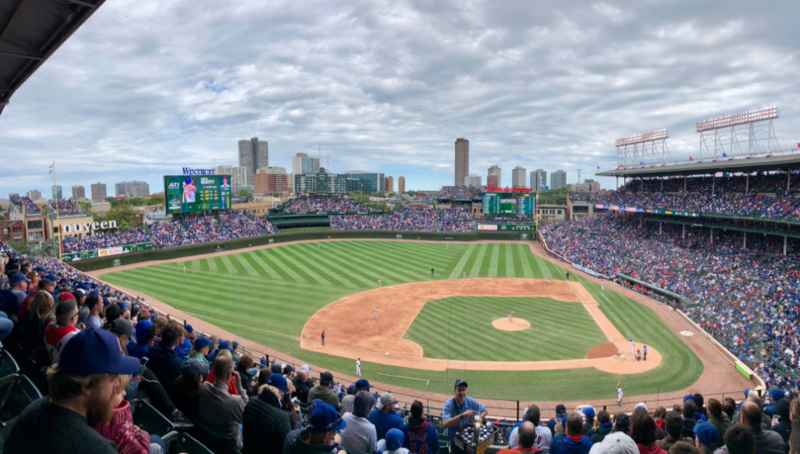 But in the sixth inning, Anthony Rizzo crushed a ball to the right field warning track that would have been a go-ahead two-run homer on a different afternoon. In the seventh, Kris Bryant drove one to the opposite field that also died just in front of the wall. And in the eighth, Daniel Murphy’s deep fly was caught on the left field warning track just to demonstrate that the Cubs were versatile enough to distribute frustration to all fields. Mikolas’s contact first approach worked so well because this was the kind of day where he could get away with it. If the wind was blowing in a different direction, it would have behooved him to become more of a strikeout first pitcher instead. Because if not, the Cubs would have won this game by at least three runs. Muñoz attempted an over the shoulder catch. And his play lived up to every bit of that description. Except for the “catch” part. The ball fell into his glove and just as quickly bounced to the ground and rolled past Martinez, who was clearly startled by the fact that a Cardinal fielder botched a routine pop fly and it wasn’t him. Zobrist was off with the pitch and easily scored the first run of the game (+.108). The whole thing looked like a pale imitation of the Willie Mays catch from the 1954 World Series. Which made sense because any time the Cardinals actually catch a fly ball, it looks like an optical illusion. Bottom Play (WPA): The Cardinals scored their first run on Paul DeJong’s looping liner to left field in the fourth (-.112). So did John Smoltz actually enjoy anything about this game? Well, in the fourth inning, he predicted that Yadier Molina is going to Cooperstown. Which is how you know he’s ignored every stat he’s ever seen. Up Next: Last game of the regular season! And it’s going to be a big one as Mike Montgomery takes on Jack Flaherty. Len sure looked uncomfortable in that suit and tie. He did a great job sounding neutral despite burning up inside. “Bitter Spice” was the top WPA phrase of this article. Great work, Ken. I used to like Smoltz when he first started, but he has become something of a whiner. He also doesn’t seem to notice that the majority of the players on the field are hitters.